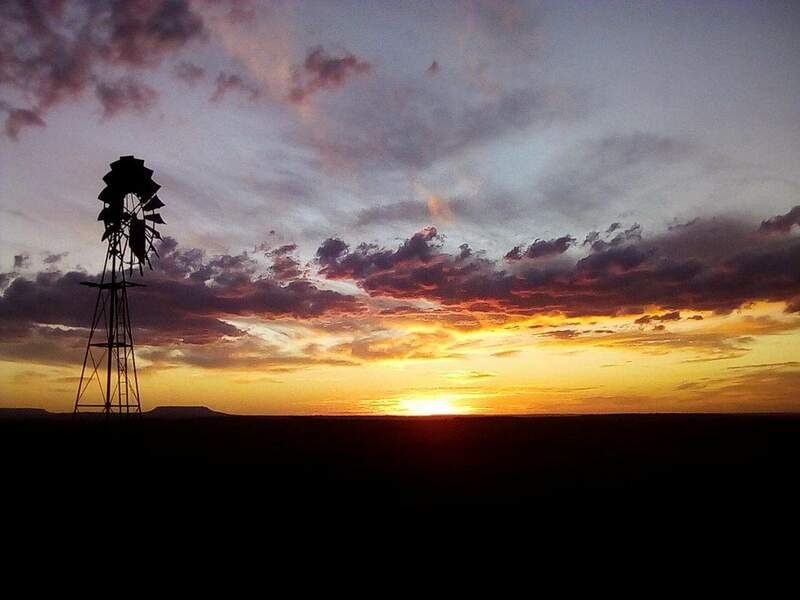 There was great excitement on the farm because the borehole drilling team had arrived just before sunset. That night, Juan was so excited that he struggled to fall asleep. He had been praying because it would be such a huge benefit to have an abundance of water on the farm. Dad would be able to increase his livestock, and Mom could enlarge her vegetable garden and — maybe, just maybe — Juan could convince his dad to buy him a couple of fruit trees. He would water them and they would produce sweet, juicy peaches, apricots, pears, apples and maybe even avocados, or oranges or lemons to make lemonade from. When Juan eventually fell asleep, he had the most amazing dream. He dreamed that seven men were standing around a large, shiny silver bowl of water. One of the men asked Juan if he wanted to be filled with the Holy Spirit. He eagerly replied, "Yes, please!" The man handed him the bowl of water and he drank and drank and then suddenly fell to the floor, grabbing his tummy. Then his hands shot up into the air and he started praising the Lord aloud with strange sounds coming from his mouth. He woke up, still praising the Lord with his hands straight up in the air. Still baffled by the strange but wonderful dream, Juan suddenly heard the loud RRRacataca-rrracataca-rrracataca of the borehole drilling machine. He jumped out of bed, got dressed quickly and ran outside to the drilling site, joining his dad at a safe distance from the drill. They watched as the drilling machine drilled deeper and deeper. Suddenly the drill bit was being pulled up, "Dad! Did they get water? Why are they pulling up?" Juan tried to make his voice heard above the loud noise. "Not yet, son. They are pulling up to put in some casings first. Otherwise, the hole may cave in!" Juan strained his ears to hear what his dad was saying. The men put a casing in the hole, and then punched it down as far as it would go. Then they put on the drill bit again and continued drilling. At lunchtime, Mom brought some delicious, chicken pies and ice cold lemonade to the site for everyone to enjoy. Refreshed, the men continued drilling and adding casings in turn. By late afternoon, suddenly, the soil coming from the drilling hole was getting wetter and wetter and, yes, a few minutes later, sweet, clear water streamed from the borehole. Juan jumped in the air with joy as broad smiles lit up everyone's faces. Juan could see his dad had a new spring in his step because of the prospect of everything flourishing with life. 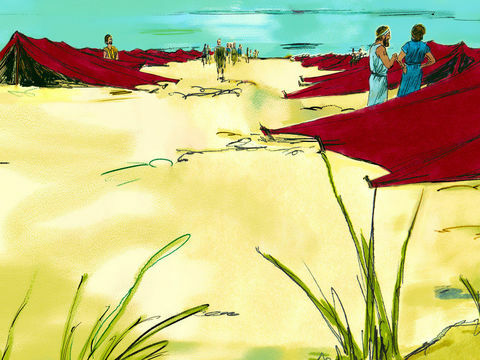 Still full of excitement about the miracle crossing through the Red Sea on dry land, and then dancing joyfully with Miriam singing the Lord's praises because of their deliverance from the Egyptian armies, three young girls, hopped, skipped and jumped back to their family's tent. "What a great and mighty God we serve! He made a miracle road for us through the Red Sea!" the oldest said, dancing with her hands held high up in the air. "And He made our enemies drown in the Red Sea with his mighty hand," the middle one said, dancing in unison with her older sister. "I'm sure He will always keep us safe!" the little one said as she tried to keep up, copying her older sisters. Moses smiled with content at the faith of these little ones and he hoped that the adults would share their trust in the Lord and believe with all their hearts that the Lord would protect them and provide for them, no matter what. With the road through the Red Sea covered with sea water again, blocking the way back to Egypt, Moses led the Israelites into the wilderness of Shur. The first day in the desert went by as they walked and walked. Not a river, not a dam, not even a well was in sight. To quench their thirst, they drank water from their water bags. The second day went by as they walked and walked. Again, not a stream, not a pool, not even a spring was in sight, and the water levels in their water bags dropped considerably. 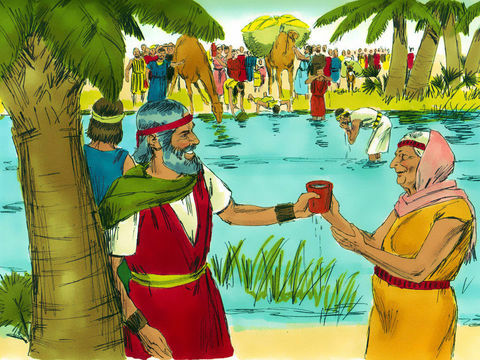 After three days of traveling in the barren wilderness without finding any water, the water bags of the Israelites were empty and they were getting anxious for their animals too. The people were irritated with their circumstances and made a huge mistake: They did not pray to the Lord their God and ask for help. One man did pray: MOSES! He prayed the whole time and he knew the pillars of cloud and fire, were leading them on exactly the route God wanted them to take. He knew sometimes the Lord leads you into difficult places to teach you to trust Him in every circumstance. Suddenly, in the distance, the Israelites saw the shimmering of the sun shining on a pool of water. Was it real, or was nature playing tricks on them with a mirage? Some of the people ran towards the pool to get there first and see if it was real or not. And, YES, it was real water, but as they tasted it, their faces twisted in horror. "UGH! OH, NO!" They spit out the water. Now they knew why the place was called "Marah" — because the water was bitter. "MOSES! 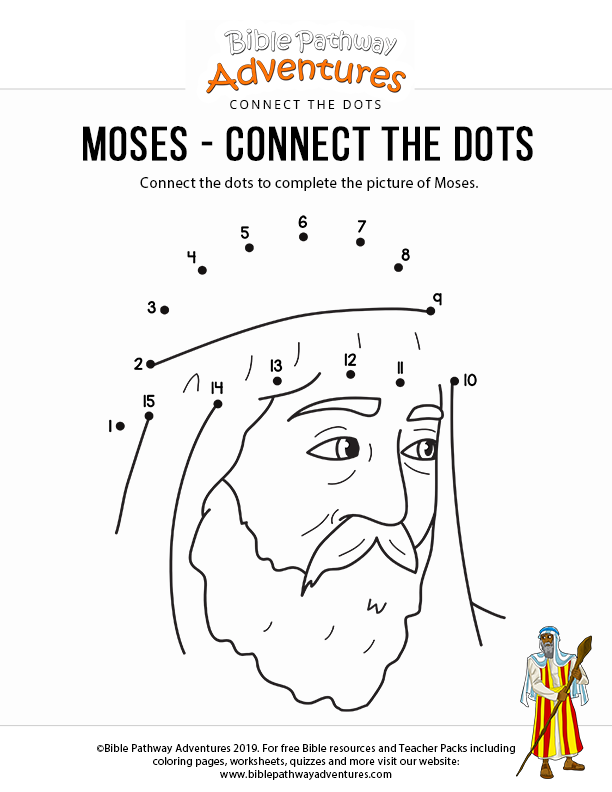 MOSES!" they loudly voiced their discontent. "We can't drink this! Must we die of thirst in this desolate, dry land?" 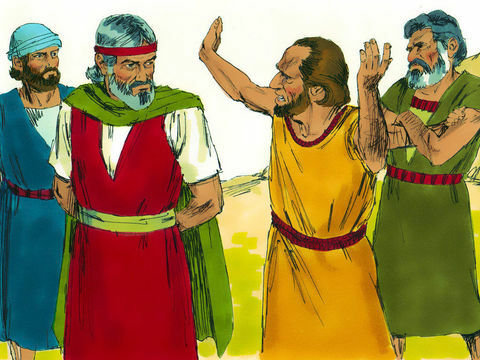 Moses, feeling responsible for this complaining people, knew just where to go for help. 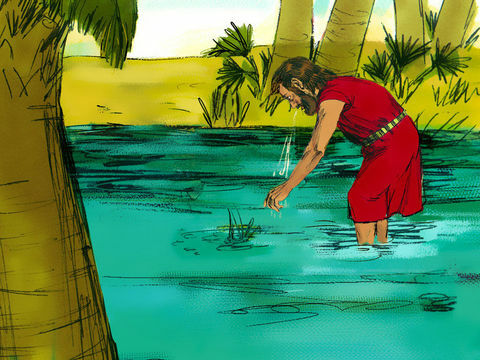 He pleaded with the Lord to help them, and the Lord showed him a tree to throw into the pool. Moses obeyed and it splashed into the water. Leading by faith, he bent down, scooped up some water in a cup and drank it. The people carefully followed his lead and, yes, the Lord had done a miracle. The water was sweet as can be. All the people quenched their thirst and filled their water bags to the brim before watering their livestock. With their thirst quenched, the Lord spoke to the Israelites there at Marah. He made a commitment to them and said, "If you listen to my voice, obey Me and do what is right, I will keep you free from all the diseases the Egyptians suffered, because I AM the LORD WHO HEALS YOU!" It was almost as if He said, "If you disobey the Lord, your life will be bitter, like the bitter waters of Marah. But if you obey the voice of the Lord, like Moses did when he cast a tree into the water, He will heal you just like He healed the water of Marah and your life will be sweet." The Israelites understood and agreed it would be good for them to obey the Lord, so the Lord led them to the lovely place of Elim. From a distance they could see the green branches of tall palm trees swaying in the wind, beckoning them to come closer. The kids strained their eyes to count the trees, and when they arrived, they concluded there were 70 lush palm trees around 12 springs. How refreshing the sweet, cool water was after a long day's walk in the desert! How faithful God was! 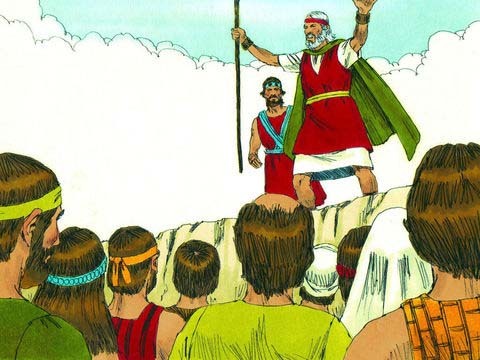 The Israelites could not stay at Elim forever, because they had a desert to cross to reach the Promised Land, so the pillar of cloud lifted again and the Lord led them to the wilderness of Sin where He miraculously provided manna and quail for them to eat, despite their murmuring and unbelief. Then the Lord led them to Rephidim but, yet again, the situation seemed impossible because there was no water for them to drink. Did they trust the Lord this time because of all the miracles He had done before? No, they wondered, "Is it really the Lord leading us through this barren land without water? Did He make a mistake? And what about Moses? HE convinced us to leave Egypt. HE must take care of us, or did he lead us out to let us die of thirst in this scorching desert?" All this unbelief and questioning caused them to work themselves up into a mad frenzy, picking up rocks to stone Moses, yelling at him, "Give us water that we may drink!" Kids hid themselves wherever they could find a hiding place, fearing their parents might stone their hero, Moses, to death. Moses replied, "Why do you pick a fight with me? Why do you tempt the Lord by not believing in Him after all the miracles He did for you, showing his love for you?" But the people were angry and wouldn't listen, saying, "Why did you bring us out of Egypt? To kill us, our children and our livestock with thirst in the wilderness?" Moses didn't get angry with them; neither was he afraid of them, but he knew where he could find help, so he petitioned the Lord, "What shall I do with this people? They are almost ready to stone me!" The Lord faithfully replied, "Moses, take your rod with which you struck the Nile, gather some of the elders with you and go out before the people to the rock at Mount Horeb. There I will meet you and you'll strike the rock and water will gush from it so that the people can drink." 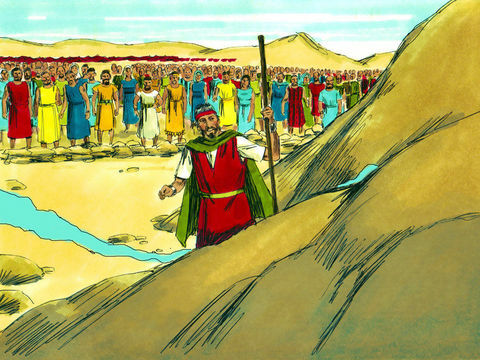 Moses did exactly as the Lord told him, picking up his rod and leading the elders to the rock at Mount Horeb. 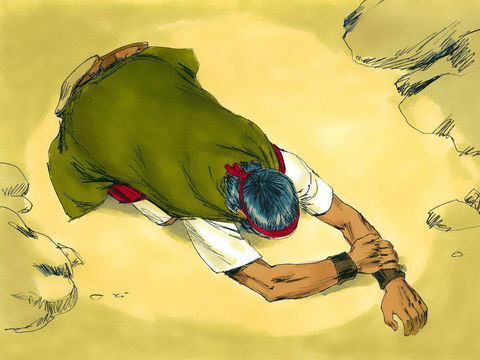 When he struck the rock right in front of the eyes of all the elders who came with him, there was a loud rumble of splitting rock, followed by a rushing sound and sweet, crystal clear, refreshing water gushed from the rock, providing enough for all the thirsty Israelites, their children and their livestock. Once again the Lord proved to the Israelites that He cared about them and would provide all their needs. The physical thirst of the people was quenched that day, but not their spiritual thirst, because they still didn't fully believe that the Lord was with them, and loved them and would provide all of their needs. Moses gave the place two names. The first was Massah, which means "Tempting the Lord," because they asked, "Is the Lord among us or not?" The second was Meriba, which means "argument" and "strife." Juan's dad closed the Children's Bible and said, "You know, the rock in this story is a picture of Jesus Christ. He was struck and crucified for us, pouring out his life for us. And now He quenches our spiritual thirst with his Holy Spirit filling us when we believe in Jesus and obey Him with all our hearts and souls, and minds and strength." "Dad! Dad!" Juan exclaimed. "I had an awesome dream this morning!" He continued to tell them all about his dream of drinking from the silver bowl. His dad replied, "That is a most wonderful dream the Lord gave you, son! Jesus filled you with the Holy Spirit. In the Gospel of John, He said that if we drink the spiritual water, God's Holy Spirit, it will become like an everlasting spring within us, giving us joy and quenching our spiritual longings. But if we drink from earthly water, like this borehole we drilled or when we seek to be satisfied by earthly pleasures, we will become thirsty again. Then we will keep on searching in other places, like the Israelites travelled from one place to another to quench their thirst with water. But true spiritual water is found only in one place, and that is in Jesus." Taking a sip of water, Juan's dad continued, "Remember the casings that were put into the borehole to prevent it from becoming blocked? Well, when we sin, we grieve the Holy Spirit and it causes the living waters within us to become blocked. The Holy Spirit will make you feel guilty about your sin. But if we ask the Lord Jesus for forgiveness, He forgives us and unblocks the flow of his Holy Spirit in us. Just like water brings life to plants and animals in different ways, the Holy Spirit makes good things happen in our lives (fruit and gifts of the spirit), such as giving us love, joy, and peace, and we receive power to obey God and to witness to others, telling them what Jesus did for us on the cross and what He is still doing in our lives. He also helps us understand the Bible and aids us when we pray." Juan smiled because he knew deep in his heart that Jesus gave him the Holy Spirit and he'd never have to be spiritually thirsty again. Only Jesus Christ can satisfy your spiritual thirst by filling you with his Holy Spirit. 1. What was the name of the place of bitter water? 2. What did Moses cast into the water to make it sweet? 3. How many springs and palm trees were at Elim? 4. What did Moses strike with his rod to make water flow out? 5. What does the rock picture? 6. What does the water picture? 7. Would you like to have the Holy Spirit flow like a heavenly spring within you? "But whosoever drinketh of the water that I shall give him shall never thirst; but the water that I shall give him shall be in him a well of water springing up into everlasting life" (John 4:14). "In the last day, that great day of the feast, Jesus stood and cried, saying, If any man thirst, let him come unto me, and drink. He that believeth on me, as the scripture hath said, out of his belly shall flow rivers of living water" (John 7:37,38). Last updated March 23, 2019.